You talked all the time about wanting to do art and I think if you had had your retirement you would have had a go at things. Because you said the pressure of wanting to be creative was so building up in you and it was what you really wanted to do. The last couple of years, I was very pleased with you because you did at last have a go at entering the Royal Academy Summer Exhibition, which we always went to see together. The first year you didn’t show me what you entered. I know you put down a title and then had to come up with something to fit that title. You told me afterwards it was a painting of a chameleon – but he was grey, he hadn’t picked up the colour of his bright background. I’ve yet to find this. I remember you actually took this in to the RA and stood in the queue to submit it. That was the last year you had to do that, before they made the initial submissions online only. But this last year gone, we entered two things in your name. The first was ‘Horsemeat Magritte’. It was a photo of a beefburger, with the caption, ‘This is not a beefburger’. It was a reference to the horsemeat scandal but was a year too late really, it would have been more topical the previous year. Well, I helped you ‘realise’ the idea by photographing a real beefburger and scanning a collage to get a an image file which we got printed and framed. HMM (as we called it in code to each other on our work emails) got through to the next round, though it didn’t get selected for the exhibition. You commented on how it showed that they preferred conceptual art – an idea rather than just a pretty picture. But you had paid in advance for two slots and as the deadline for submission approached, it became an issue that there was no second piece. You weren’t going to bother, but then said you had an idea of something you wanted to do, but it depended on finding a particular object around the house. So when I came back home one day, you showed me what you had done – you said it had taken you an hour and a half. 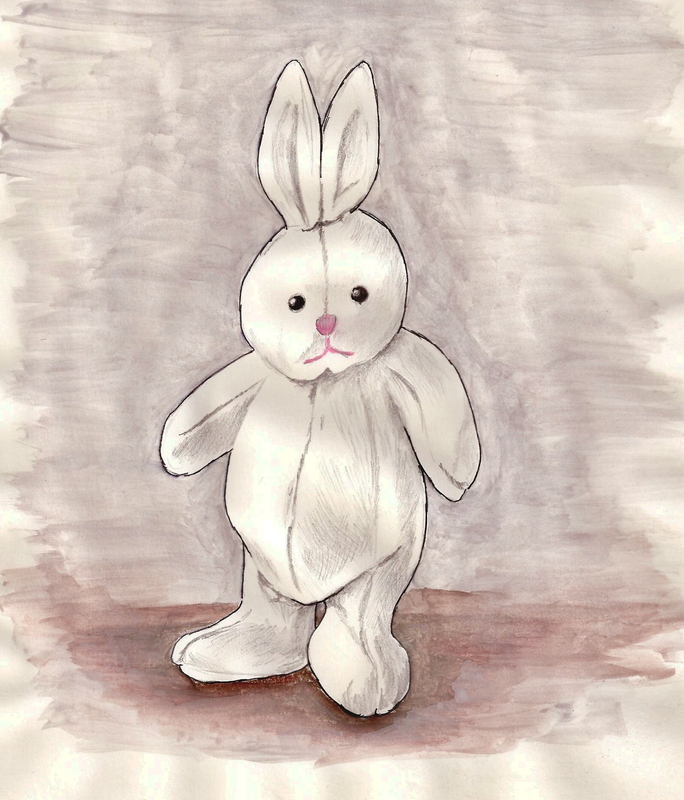 It was a drawing/painting (some background watercolour) of a small cuddly toy rabbit, standing up. He’s rather humorous. You had thought it would make a good picture. I thought it was good – probably if you’d had several goes, it would’ve been even better. I scanned it for you, for the entry, and we called it ‘Bunny’. I suppose it wasn’t worthy of being selected, but it could have been. But that Bunny drawing is now ultra special because it is one of the very few pieces of art that you actually ever did. I intend to frame it shortly. I’m sure you would hate other people to see it because you wouldn’t have thought it good enough or representative enough. But it will always be so special to me – you could never have guessed how very special it would become. Bunny himself – the toy – came to visit you in intensive care once or twice. I thought I would be able to tell if your mind was okay by whether you appeared to recognize him. But you were never conscious enough for me ever to show you. I think I tried, but there was no recognition.